I wrote to my representative in Congress to let him know I was not at all happy with his “no” vote on the Amash Amendment, which failed today in the House. Others, if they so desire, can use this format and just put in the applicable information or re-word it to better fit what they want to say. If you’re not sure who your representative is, go here and cross reference that with the “yes” and “no” votes on the amendment here. I don’t see how the Speaker can purport to be for smaller, more accountable government with better solutions when he votes “no” on something as vitally significant as the Amash Amendment, which would have gone a long way to curtailing the 4th Amendment abuses of the NSA. Not to mention, it would have made the intelligence community more accountable to the Congress and the American people. 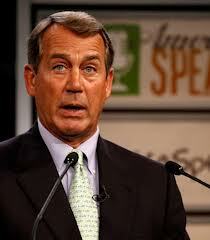 The Speaker took an oath to uphold the Constitution of the United States, which includes the 4th Amendment. That is all that matters and with his “no” vote on the Amash Amendment, Speaker Boehner has showed his colors more than ever as a big government enthusiast and someone not at all concerned about the rights and privacy of American citizens or with ensuring the proper checks and balances of our so-called democracy are in place. This is a letter a friend of mine submitted to Speaker of the House John Boehner on his failure to uphold his oath to “support and defend the Constitution of the United States against all enemies, foreign and domestic.” I would suggest that we all send similar letters to the other congressional representatives who have served to protect the National Security Agency’s unconstitutional domestic spy programs. We have a voice in this government, and it’s about time we made use of it. Well said and thanks again for the reblog.